On May 5, 1969, I arrived in Vietnam (Cam Ranh Bay) with other members of my flight class. World Airways, the government contractor hired to fly GI’s to and from Vietnam, delivered me there on a cramped Boeing 707 (or maybe a stretch DC-8) from McChord AFB, Washington with a refueling stop in Honolulu. The first impression of Vietnam came when I walked down the steps from the airliner and onto the tarmac. The heat, humidity and smell of the place was oppressive. It took a minute or two before you could breathe. The sweet smell of the tropics mixed with diesel and aircraft exhaust would remain for a year. The Army loaded we freshly-minted Warrant Officer pilots and a couple of hundred other newbies onto a batch of buses and off we went to an in-processing center. “Ah, hey Sarge, what’s with the chicken wire that covers all the windows on the bus?” “Well, sir, that way the Viet Cong can’t throw a hand grenade in here while we’re driving down the road and kill you.” Welcome to Vietnam! Some of my classmates and I had been assigned to the Americal Division, headquartered at Chu Lai on one of the many beautiful South China Sea beaches. We were processed through the Division’s “Combat Center” and received our assignments to various helicopter units in the Division. Some would be KIA, others badly injured, others never got a scratch. That night in the “Colonel’s Mess” as it was called and where only the Brigade staff officers ate, I was introduced to the Brigade Commander, Colonel Thomas Tackaberry and his staff of about 20 officers. I would have my first legal beer. As the new-guy, kid Warrant Officer, and it being the kid’s 21st birthday, Colonel Tackaberry and all the Brigade staff officers made me feel very welcome. I sat at the pilot’s table toward the back of the small mess hall, right next to the open bar. It was a great feeling and a great evening, the first of many memorable events in Vietnam for this youngster from Missouri. It turns out I had been assigned to a very unusual aviation unit. We had only for LOH helicopters and only four pilots. We supported the Brigade staff, flying any mission they required. 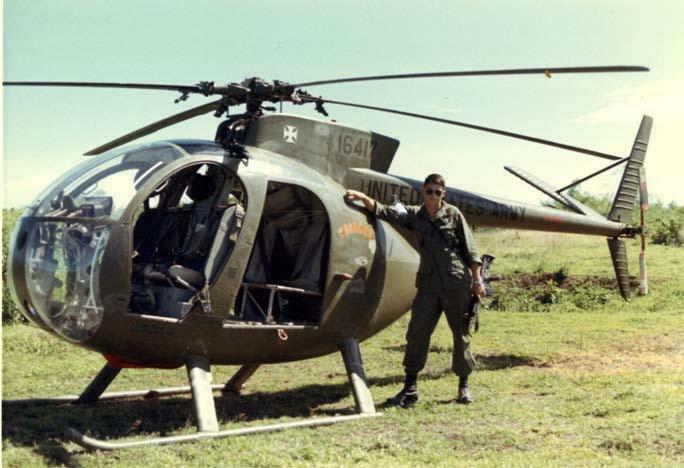 Most Army Aviators were assigned to large assault helicopter companies which had scores of helicopters and scores of pilots and hundreds of support personnel. So, I became a “Charger” pilot, the call sign for the 196th Brigade. We were stationed on LZ Baldy, which was as far forward and small as any base in Vietnam where helicopters were assigned. Our little unit flew one pilot (all the LOH required), with no crew chief, no copilot, no gunner. All our missions were single-ship, no cover. We flew all kinds of missions: Taxi, supply resupply, medevac, sniffer, extractions, insertions, recon, spotter, you name it, we did it. It was a great unit and I was fortunate to have some wonderful commanders and fellow pilots.